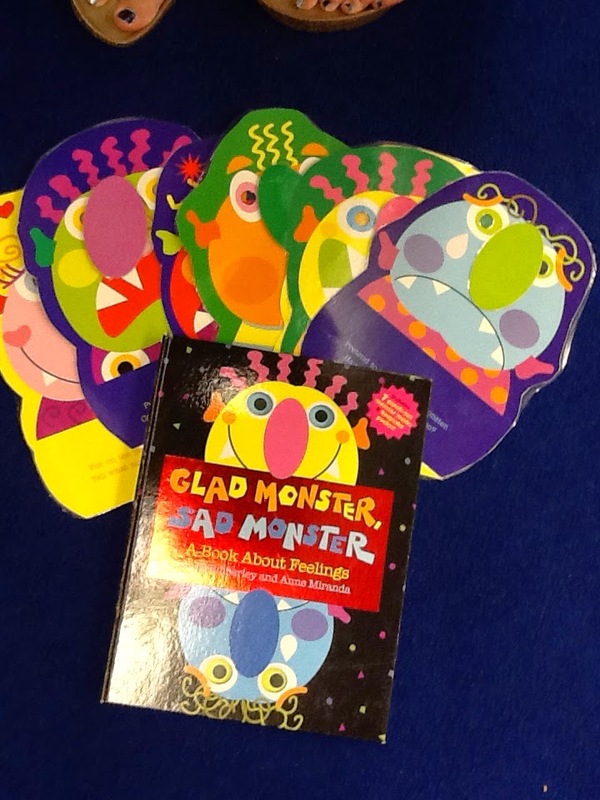 We 'read' the story Glad Monster, Sad Monster by Ed Emberly & Anne Miranda. We did this by holding each of the masks up that came with the book and following the pattern of the story but replacing it with scenarios we knew the students had experienced. For example, "The timer rings and I want to keep playing but I have to clean up. That makes me sad." "My parent isn't there when it's time to go home or the bus is running late and I don't see it. That makes me worried." Then I asked each student how they felt that day and we charted it on our chart (as shown above). Talking about familiar scenarios had them thinking of emotions they felt throughout the day and so we got more the just "happy". We then counted them up and asked which had more and less. They they students picked what they want to do while they are happy and we sang, "If you're happy and you know it, (students selected)" as they went to grab their backpacks. We 'read' the story Glad Monster, Sad Monster by Ed Emberly & Anne Miranda. As with the activity above, we did this by holding each of the masks up that came with the book and following the pattern of the story but replacing it with scenarios we knew the students had experienced (for examples see above). If your angry and you know it make a frown." We also emphasized that it's okay to feel that emotion, especially that it is okay to feel mad or angry. It's what you do that can be okay or not. It's okay to feel angry but it's not okay to push a friend. It's okay to feel angry and it's okay to say, "Stop that, I don't like that". After each student had a turn, we sang, "If you're happy and you know it, grab your backpack" as they went to grab their backpacks.